This hotel is located directly on the E60 international E-road, making both it and the Predeal skiing area easy to reach. Predeal is the highest locality in Romania. Its proximity to the mountain summits of Piatra Mare (1,844 m above sea level) and Postavaru (1,800 m above sea level) mean that the hotel is the ideal starting point for mountain tourists in all seasons. The hotel comprises a total of 51 rooms and features a restaurant with a capacity of up to 140 guests, in addition to modern and completely equipped conference facilities. The rooms are comfortably furbished. All offer guests wonderful views over the surrounding mountain panorama. Breakfast is offered to guests every morning. Lunch and dinner can be taken à la carte. It is possible to book a Bed & Breakfast stay. 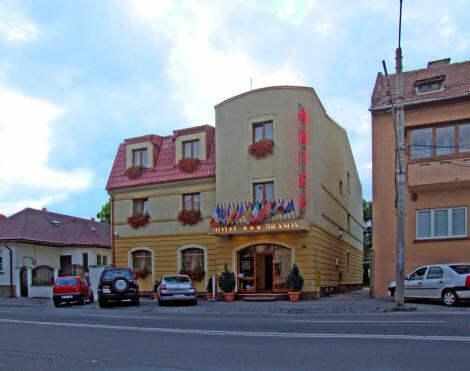 Located in Brasov, Hotel Brasov is a 4-minute drive from Silviu Ploiesteanu Stadium and 5 minutes from Council House. This hotel is 10 mi (16.1 km) from Poiana Brasov Ski Resort and 1.5 mi (2.5 km) from Piata Sfatului. Located just steps from the ring road of Braşov, next to a petrol station, Stop Hotel is 400 metres from the local bus stop. Coresi Shopping Resort is just a 5-minute car ride away. The hotel offers rooms with air conditioning, a flat-screen TV with cable channels, and a fridge. All units feature private bathrooms. Free WiFi is provided in the entire property. The Old Town of Brasov is 6 km away. Guests of the Drachenhaus Stop Hotel can go skiing in Poiana Braşov Ski Resort, 20 km away, or explore the area of Transylvania and its fortified churches, such as Rupea, 62 km away.